What is the weight capacity of the SnapSafe Under Shelf Baskets? Each basket is rated to hold 40 pounds. What batteries do the SnapSafe Safe LED Lights require? They require AAA batteries. The 6 LED Safe Light requires two batteries, and the 20 and 30 LED Safe Lights require six batteries. What hardware will I need to install my door organizer? Each SnapSafe Door Organizer comes with all necessary hardware for installation. Are there bolt down holes on the Under Bed and Trunk Safe? Yes, there are four bolt down holes in each safe for securing to the floor, workbench or vehicle. Can I secure my safe without drilling into the floor? Yes, the Trunk Safe and Under Bed Safe each come with a commercial grade cable for securing to a stationary object. How does the In Wall Safe mount? The SnapSafe In Wall Safe mounts between standard width studs inside a wall. All installation hardware is included. Can I get installation instructions for the vault room door? Yes, they are available on the Vault Room Door product page. Does the vault room door have an internal release to get out? 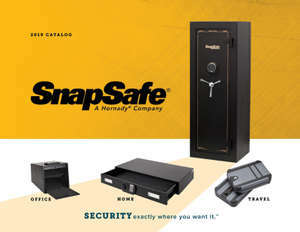 Yes, all SnapSafe Vault Doors have an internal handle that can lock and unlock the door from the inside. What hardware is needed to install the Vault Door? Your SnapSafe Vault Door comes with all the hardware needed for installation, including a ratchet for installing the bolts.